Anybody who lives in Southern California can tell you that it is sunny out nearly every day of the year, so if you own a home in the Los Angeles county, you might want to think about getting solar electric services Northridge for your home to cash in on incredible savings on your energy bill. Considering the fact that your home is being hit by sunlight almost every day, you are missing out on free energy unless you have already had solar panels installed and connected to your home’s power inverter. Solar power is a sustainable and renewable energy source that does not depend on fossil fuels or gases, and produces no emissions that are harmful to the environment; photovoltaic solar panels generate clean electricity. The set up process for our electrical services Northridge are performed by our skilled team of installers, electricians, and engineers who also have roofing experience to guarantee top quality installations, using only superior products and technology in today’s market to provide you with maximum energy efficiency. We begin by analyzing your usage history and performing a complete site inspection to determine ways to make your home more efficient, check the condition of the roof and main electrical panel, as well as the roof layout and shading factors. With this information, we determine a quote that accurately defines all of the equipment and scope of work; we also file all necessary paperwork for you to obtain utility rebates and interconnection agreements. Once your paperwork has been accepted, we measure the roof area and create a layout for the panels that our electrical engineers can design for your system. The Building and Safety and Fire marshal require plans for review and permit approval, which we submit for you. Once you have been approved, we schedule a date for installation. When the day arrives, we will provide our electrician services Northridge with our team of installers who work to ensure that connections from the panels to the main electrical panel are functioning. Once complete, Building and Safety is contacted for an inspection, and paperwork is submitted to the utility company in order to obtain a Permission To Operate. After you have received the Permission To Operate, your solar system is ready to produce clean, free energy for your home. With your new solar panels absorbing light from the sun every day, your home no longer will be using the power grid, which also effectively eliminates your power bill. With solar power, you can lock in your low rates for your electricity bill. Moonlight Electric Services Northridge offers licensed, bonded, and insured electrical services for your home, by our reliable and experienced team of electricians. Whatever electrical appliances, lighting, rewiring, or installation you may need for your home, Moonlight Electric Services, Inc. is ready to complete the job. The moment you start to experience issues with your home’s electrical system, don’t hesitate to get it repaired, as it could lead to worse problems. 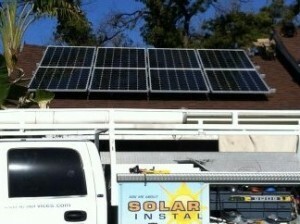 Find solar electric services Northridge you need to get your home’s electrical system functioning as it should.